Modi hits back at Opposition, says he feels honoured to share pain of the poor. Prime Minister Narendra Modi on Saturday hit out at the Opposition for the ‘chowkidar- bhagidar’ remark directed towards him. He said he had been dubbed a ‘bhagidar’ (partner) and he was taking this insult as an ‘honour’. He was a partner with the poor and the downtrodden in their pain and sufferings. He was also a ‘bhagidar’ with the unemployed or those who were forced to sell their land for medical treatment. The PM invoked Atal Behari Vajpayee and credited him for initiating the process of transforming the urban landscape of India. He said Lucknow was used as a laboratory by the former PM to take the country on the road of urban development. His strides in this direction was guided by his thinking that without improving on the old one cannot build on the new. The PM who devoted a major part of his speech to Atal Behari Vajpayee said his government was working on the same lines with improvements. The NDA government was committed to provide housing for all by 2022, when the country celebrates its 75th year of its Independence. He added that 54 lakh houses have been sanctioned in the urban areas in the last three years and 1 crore houses have been handed over to the people in the villages. Modi said the former Lok Sabha MP from Lucknow, had introduced the concept of giving houses to the poor when he launched the ‘Balmiki Ambedkar Awas Yojana’ in 2001 by giving 10,000 houses to the poor in the country. Modi said his government has carried forward Atal’s legacy with modifications which include increasing the size area of the houses and giving the beneficiaries a whole package in the form of a home replete with toilet, electricity and LED light. While on one hand Atal Behari Vajpayee had got constructed flyovers, the Scientific Convention, Bio-Technology parks in addition to a network of roadways in Lucknow, on the other he was the spirit behind the Delhi Metro, the PM said. While the expansion work of the Lucknow Metro was already underway the success of the Delhi Metro was being replicated in other parts of the country. The Prime Minister said this in his speech at a function on ‘Transforming Urban Landscape’ at the Indira Gandhi Pratishthan. The function was attended by mayors from 86 cities of the country. 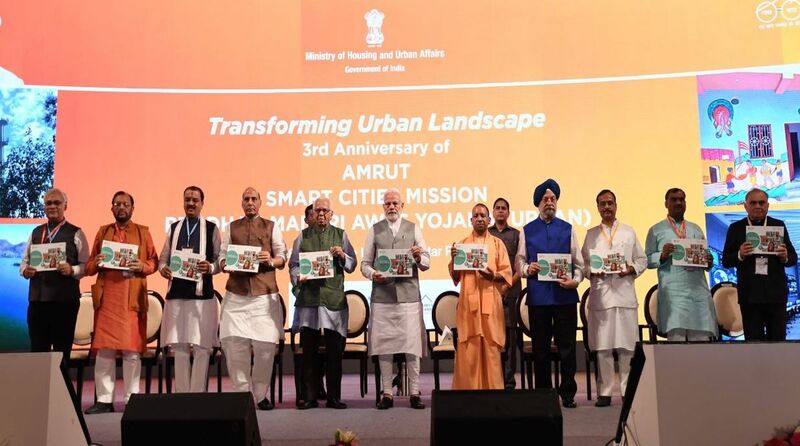 The function also marked the third anniversary of the Atal Mission For Regeneration and Urban Transformation (AMRUT), the SMART city mission and the Pradhan Mantri Shehari Awas Yojana. On the occasion the PM also laid the foundation stone and unveiled 99 projects worth Rs 3897 crores.